In Japanese, senpai 先輩, means somebody's "senior." That is, someone who has been in an organization for longer than you have. This organization can be a school, a workplace, a school club, etc. Sometimes it can refer to someone who has been doing an activity, like a sport, for longer than you have. The opposite of senpai would be kouhai 後輩, "junior." For every senpai, there's a kouhai, and vice-versa. Someone who is neither a junior nor a senior is a douhai 同輩. These words are also romanized sempai, kōhai, and dōhai. When the word senpai comes after the names of people that's called a honorific. Which is like the common honorifics san, chan, sama. More specifically, senpai works like the word sensei 先生, "teacher," as they're both nouns, titles, honorifics. With great seniority comes great responsibility. The senpai often has duties and responsibilities that a kouhai doesn't have. The main duty of a senpai is to teach the kouhai the ropes of the job or activity. The layout of the office, school, or organization. Who is responsible for what, introduce the people. Explain how things work. ato wa wakaranai koto attara senpai ni kiite kure. Later if there's something you don't know ask your senpai. A trope that often happens in anime is when a character, normally the protagonist, starts an activity, or working somewhere, even in a school club, thus they're the most kouhai character of all in there. The most inexperienced. The bottom of the bottom. And then, after learning a lot of stuff for the episodes and episodes, or chapter and chapters, a new character enters their group and are placed under their care and supervision. That is, they gain a kouhai of their own. They are the senpai now. It's a pivotal point of character development, as it conveys the growth of the character: they were on the learning end before, now they're on the teaching end. In the first episode of Psycho-Pass, the protagonist Tsunemori Akane 常守朱 joins the law enforcement, welcomed by and placed under the supervision of Ginoza Nobuchika 宜野座伸元, her senpai. 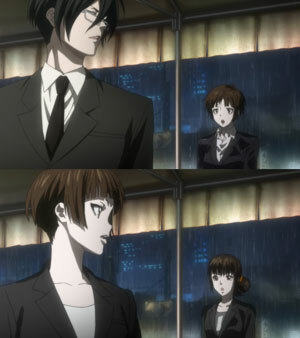 In the last episode of Psycho-Pass, the scene from the start of the series is recreated, this time with Shimotsuki Mika 霜月美佳 joining the law enforcement, welcomed by and placed under the care of Tsunemori Akane. The concept of Tsunemori starting as a kouhai and ending as a senpai symbolizes the growth of her character, developed through the 22 episodes. 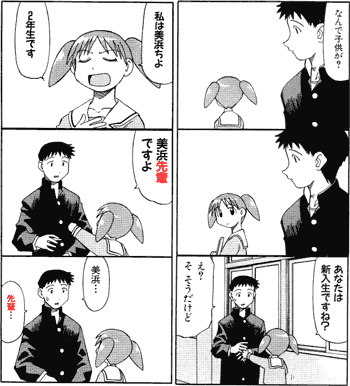 In Japan, the senpai-kouhai 先輩後輩 system is an hierarchical system where the kouhai must respect, and thus obey, the senpai. 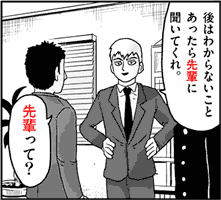 In simple words, it's thought that the senpai is more "important," erai 偉い, than the kouhai. The senpai is above the kouhai hierarchically. Me, who's the senior, 's orders are absolute. Because I'm your senior, my orders are absolute. sore wo kyohi suru tte-n-da na! [What you're] saying [is you're] denying that, [right?]! There will be consequences to your insubordination! However, that's [only] if you survive. In anime, sometimes this senpai-kouhai system is called antiquated, specially by characters that don't like the idea of having to respect their senpai and speaking politely toward them just because they're their senpai. Some senpai are useless, abusive bullies. They don't help their kouhai at all, instead seeing them as servants, slaves, or worse. The kouhai can't fight back because of social norms. After all, the senpai are "above" them. In anime, it's a common trope for such senpai bullies to exist, abusing the intrinsic authority and power of their position. They're usually villains or antagonists that must be defeated somehow so their victims can be saved. Since being a senpai has to do with how long you've been somewhere, or done something, rather than how old you are, young senpai become troublesome. That's because you're supposed to respect your elders, but you're also supposed to respect your senpai. The hierarchy becomes unclear: you don't know who's "above" who. In anime, a recurring trope is an older character having to work with a younger senpai and start hating that fact. Specially when the senpai is some child prodigy; Conversely, you'll eventually find an older character that respects their younger senpai for their skills. [Take care of me,] Kageyama-senpai. 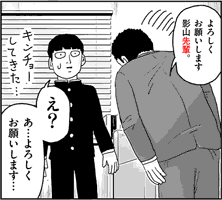 Expression used when meeting someone, or entering care or supervision of someone else, in this case, their senpai. In this case, because he's now burdened with the responsibility of having a kouhai. In anime, senpai is often translated to "upperclassmen," but that's not what senpai literally means. Children generally start school at the same age, so year age, and grade, school year, naturally matches their seniority. However, if a character skips grades and starts high school much younger than other students, they're still a senpai despite being younger. Conversely, if they repeat a grade, they can be the senpai of someone who's the same grade as them. Context: a character introduced as a 10 year old child prodigy already enrolling high-school shows the stuff she has to deal with. Why is a kid [here]? anata wa shin'nyuusei desu ne? You're a new student, [aren't you]? Eh? [Y-yes, what about it]? I'm Mihama Chiyo, a second-year student. The kanji of senpai 先輩 mean "early" and "comrade." That is, one comrade who's started the activity earlier than you. 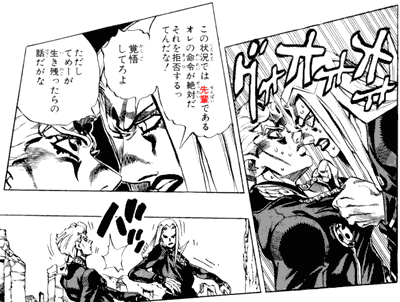 By the way, kouhai 後輩 has the same kanji as ato 後, "after, " while douhai 同輩 has the same kanji as "same," onaji 同じ.